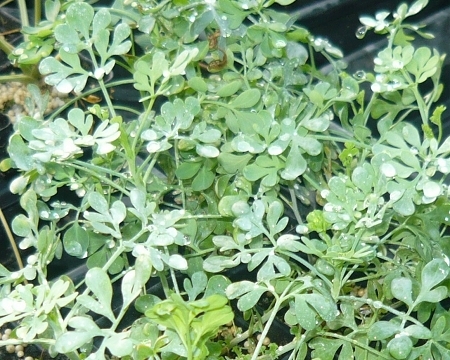 Rue (Ruta Graveolens) Attractive herb with round gray- green leaves and yellow flowers when in bloom. Reportedly repels cats from the garden and japanese beetles. Host plant for swallowtail butterflies. Please note: some individuals have a skin sensitivity to Rue and should wear gloves or use caution when handling plants. Pretty container plant. Perennial zones 5-9. Live plant in 3 inch container. All 4 plants were green and beautiful. I was home when the mail carrier delivered them so they did not sit out in the heat. They kept their shape and were not squished at all. The soil was very moist and was wrapped in plastic which kept the soil moist and prevented soil from getting everywhere. Will definitely be ordering from Colonial Creek again as soon as the Florida Native milkweed is in stock.